Walking in a Winter Wonderland? 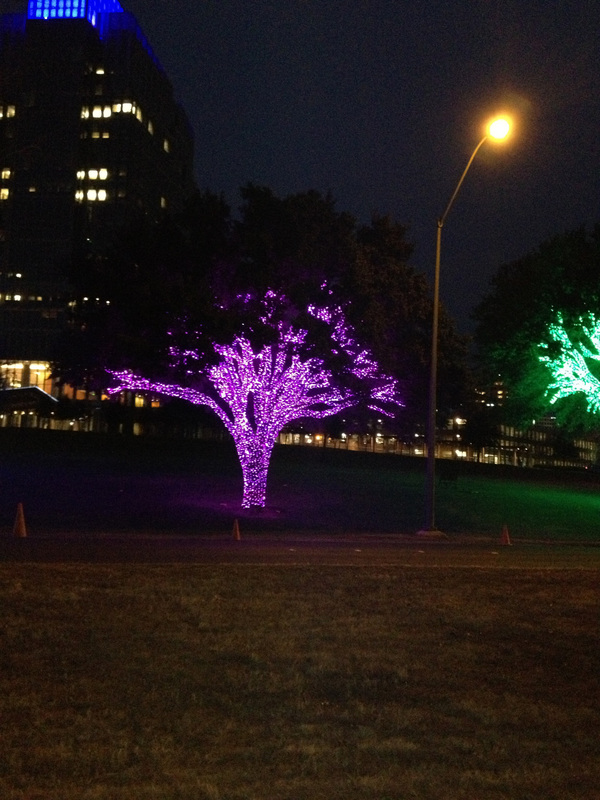 Not being able to travel for the holidays and with my young niece in town staying with my parents, I was excited when my mother asked if I wanted to go with her and my niece to see the fantastic display of lighted trees down by the Trinity River. 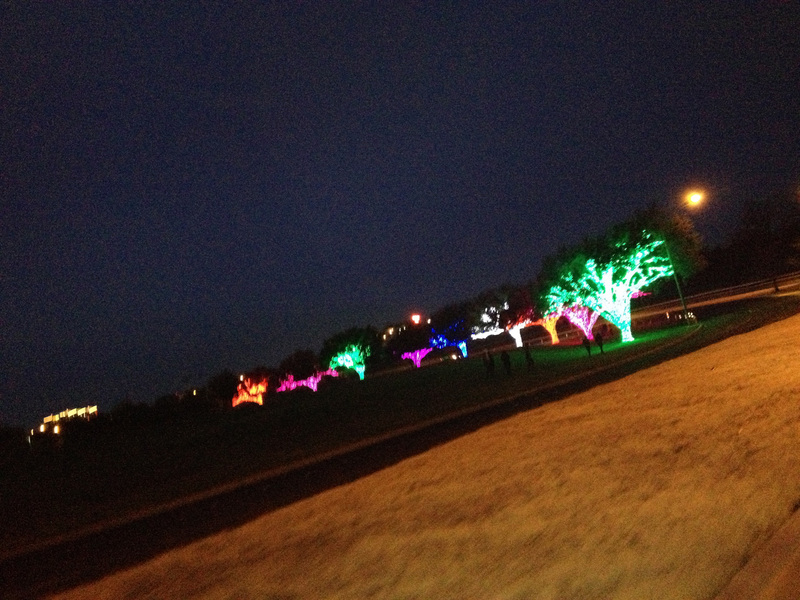 Of course, after all, she raved about how beautiful the lights were last year. So we bundle up the kid and headed downtown. The first visible array of lights were indeed gorgeous. Every tree elegantly wrapped up in lights. Each one a different vibrant color. Green, purple, red, hot pink, white, blue. As we drove around the curve, looking for a place to park, we expected to see more trees. After all, Mom said there were hundreds of trees lit up last year. And she has pictures to prove it! 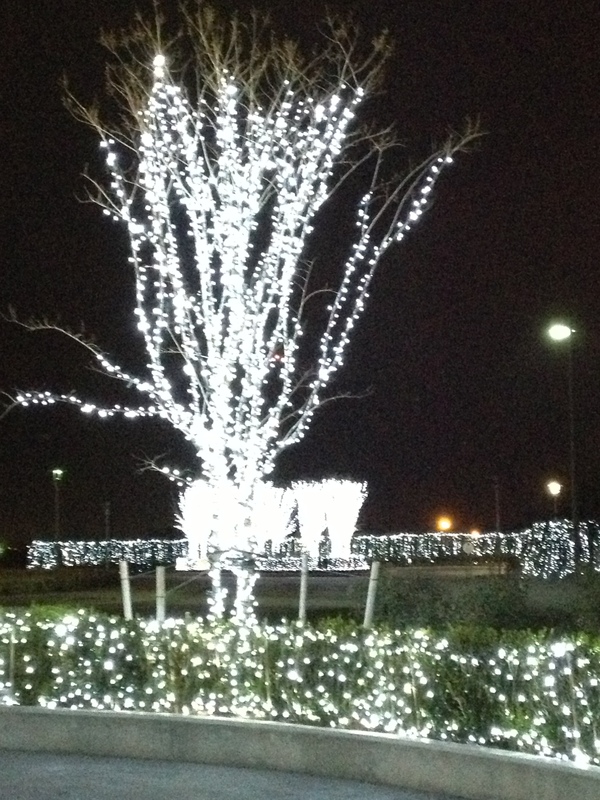 Actually, according the photos, last year was a beautiful display of lighting. But, alas, this seemed to be it. We drove around, trying to find more beautifully appointed trees. This was it. When asked if she wanted to get and walk around the ten lit trees, my niece responded that she would rather stay in the car. So, I got to hang out the car window while snapping photos with my new iPhone. Thank God it has a great camera! Eventually, after the underwhelmingness of the first set of trees, we parked outside one of the nearby buildings that had some lights up in their courtyard. Time for some better photo ops. 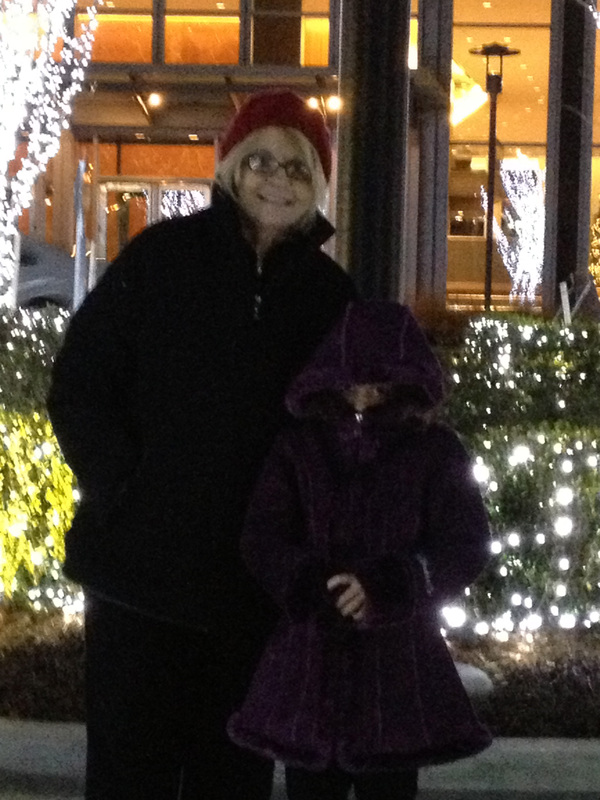 The courtyard was pretty, and the kid decided to get out of the car long enough to walk around, and enjoy the lights. The purple thing with eyes poking out would be the kid. Back into the car before we melted in the rain, off to QT for some yummy hot chocolate with Amaretto (non-alcoholic flavoring, of course!) But we were highly disappointed to find that all of QT’s hot chocolate dispensers were out of order. Ugh! 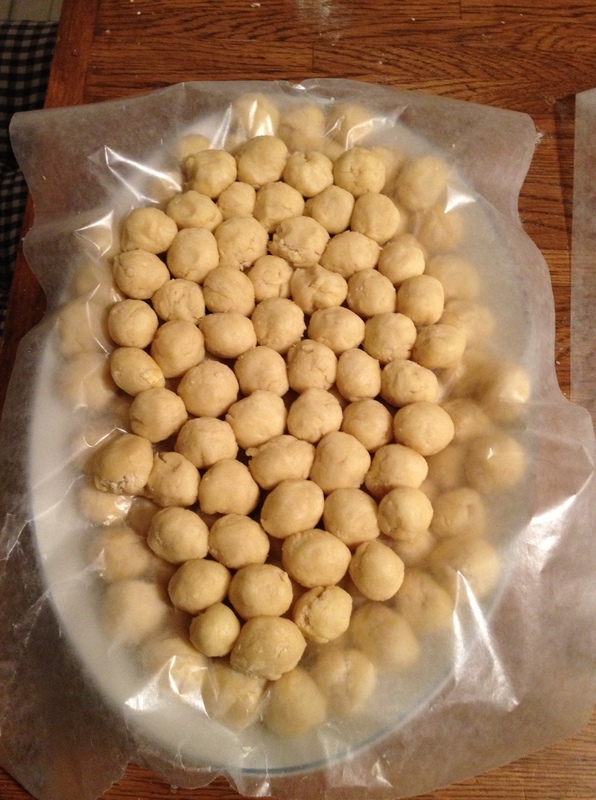 So back to my parents to make the balls for kolaczki (Polish cookies) and homemade hot chocolate. So the kolaczki balls are made and the kid is in bed. I head home to my dear sweet husband. Ugh, I never did get my hot chocolate! Is quarter past midnight too late for a chocolatey drink? So in the English tradition of Boxing Day, this morning I informed our two dogs that their Dad and I would be trading places with them today. Humans would kick back and relax while they did the housework and fed us. Some mumbling about lack of opposable thumbs. Dogs. What can you do? They’re curled up on the couch next to me, sleeping. I guess they need their sleep after all that playing in the rare snowfall we got yesterday. Hope you all had a Merry Christmas! Sorry, I haven’t written in a while. The marathon of Christmas gift-making is almost over. Okay, I’m running a little behind. But everyone loved their gifts! I will be posting later about this. Stay safe and warm tonight, folks. Every Christmas, I dream of being able to take my family to the Grand Floridian resort at Walt Disney World to celebrate. Hasn’t happened yet but I don’t stop dreaming of the possibilities. Disney is already a magical place but I’ve heard that during the holidays, it becomes even more magical. The Grand Floridian helps the holiday spirit by building a giant gingerbread house in the lobby of the Victorian-themed hotel. What can dwarf a life-sized gingerbread house? A four story tall intricately-decorated Christmas tree! And the decorations don’t stop there. Wreaths and garlands hang throughout the halls. My husband and I are both foodies, so of course we would have to check out the restaurants. The Grand Floridian has several to choose from: 1900 Park Fare, Gasparilla, The Chef’s Domain at Citricos, Victoria and Albert’s, and Narcoossee’s. Victoria and Albert’s has its own vegetarian menu. (Cue Homer Simpson drooling sounds) I would love to try the Porcinie Mushroom Soup, exotic cheese plate, and Grand Marnier Souffle. My husband will have fun picking dishes off the regular menu. After all that eating, we could relax in one of the beautifully-appointed suites or at either of the two available pools. Oh, and I hear there’s a couple of theme parks near by!